Farah Mendlesohn has posted a fascinating analysis of some of the stories in Jonathan Strahan’s YA anthology The Starry Rift. Of the stories I’ve read (I lent my copy to a friend, because I had other things I needed to read more urgently) I agree with her in some cases (Westerfeld’s story), and even in the cases where I disagree (such as Kelly Link’s story), she’s makes me think about aspects of the stories I hadn’t before. Farah also has a shiny new website, with among other things some outtakes from her forthcoming book on children’s sf. A couple more responses to the Gresham Symposium: one, two. How many books should you read to judge an award? I’ve been slow at posting my links, so I’m sure many of you have seen this, but there was a great piece about the Clarke Award in the Telegraph, by Andrew McKie. For Masterclass folks: Cheryl Morgan has a long discussion of Queer Theory, Gender Theory: an instant primer by Riki Wilchins. Locus reviews: Russell Letson on Greg Egan, Faren Miller on Felix Gilman. The results of this year’s Interzone reader’s poll. I’m behind on my IZ reading, and half-tempted to use this as a guide. It is seemly and good to reimagine the second world war in fiction. It is seemly and good to imagine the future consequences of global warming, nuclear war or overpopulation. But I do not want to live, as a reader or a writer, in some fuzzy limbo of now, bookended by holocaust and armageddon. I want to imagine the present, in all its gnarly, shaming complexity, without which its wonders and glories are bogus. Guardian reviews: Jan Morris on an interesting-sounding short story collection, and Eric Brown’s roundup, including his take on the Celebration anthology. 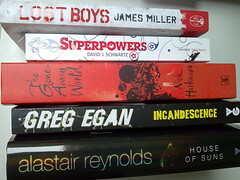 I want to read all of these right now (especially Superpowers), but sadly they’re going to have to wait for a month or so, while I get through the SFF Masterclass reading. However! Baroque Cycle reading continues apace, and there’ll be a post about King of the Vagabonds tomorrow. Google says not yet, and you’re right, I totally should. 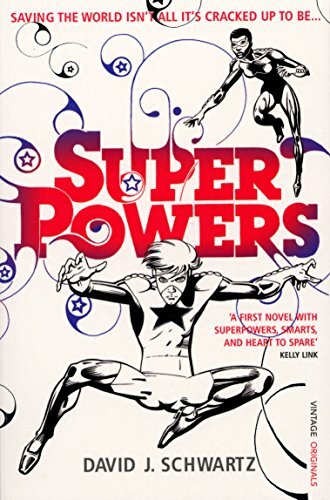 Damn you, your copy of Superpowers looks much nicer than mine. I really like the cover. In fact, the presentation of the whole book is good — Vintage have done a nice job.